Vitamins are organic chemicals that are required for metabolic activities necessary for tissue growth and healing. Under normal conditions, only a small amount of vitamins—which are provided by eating a well balanced diet—are necessary. 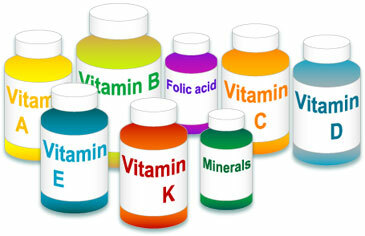 Following 10 practice questions are based on Vitamins for Nursing exam. What vitamin is converted into calcifediol in the liver? What vitamin protects the heart and arteries and cellular components from being oxidized? Vitamin K is synthesized by intestinal flora. Vitamin C is used to metabolize carbohydrates. What vitamin is used to treat acne? Fat-soluble vitamins are immediately excreted in urine shortly after they are absorbed. What vitamin is given to help alleviate symptoms of neuritis caused by isoniazid therapy for tuberculosis? Minerals are organic compounds synthesized in the liver. Spinach is a source for iron. Conditions that inhibit absorption of food.